My sister recently got involved in an organization called Operation Baking Gals. 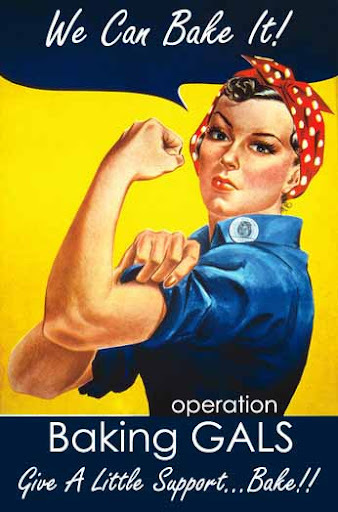 Baking GALS (GALS stands for Give A Little Support) is a group of volunteer bakers who bake and ship homemade goodies to our heroic troops that are currently deployed. Each soldier is “Hosted” by a blogger, and potential bakers are “recruited” from the bloggers own site as well as the GALS site. Each Host recruits between 20-25 bakers, meaning LOTS of goodies get delivered to our soldier…so many, in fact that he or she has plenty to share with their fellow troops! Leslie enjoyed it so much she decided to form her own team for her friends who are now serving in Iraq. Captains Terry and Hammons. These guys are Army Dentists that do an excellent job maintaining the smiles of our soldiers down range. In their dental unit there are approximately 25 Soldiers that will benefit from our sweet treats. This group of professionals see aprox. 1000 soldiers per month doing everything from fillings to root canals to crown and bridge work to dentures. They service a patient population of 60,000 soldiers and another 60,000 Third Country Nationals, Contractors, etc. on an emergent basis. I’m excited to be apart of Leslie’s group and be able to show my support to these guys in some small way. 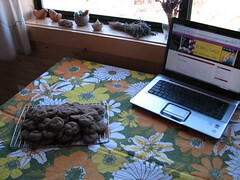 I made some Gingersnap cookies for them. 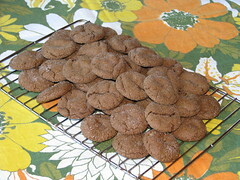 Gingersnaps are one of my favorite cookies I like the spice. So, I hope Captain Terry and Captain Hammond enjoy them as well. Cheers to them and all of their efforts, sacrifices, and hard work. So glad I peeked at your blog before my trip. Thanks so much for sharing your baking talent. Those boys have no idea the pleasure that awaits their tummies. Travis’ wife says she can just feel the smile on his face when he talks about what is coming. By the way, your baking rocks! Ginger Snaps are one of my favorites also! What a neat thing to do for our troops. You are so good at being involved with world events! What an inspiration. I noticed once that you had “Secret Life of Bees” on your reading list. Did you read it? I really want to go see the movie! Are you up for a ladies night out? Let me know! LOOKIN GOOD!! I got my pkg. sent today. Hope it makes it safe & sound. The fake Snicker Bars that I sent are GOOD! That was fun to do. Take Angie up on the girls night out for that movie!! I am crying right now because I am so proud of you guys! Michelle has been in tears all day as she mailed her box. What a super bunch of girls our family has. Next time, when my thumbs work again, I want to participate! Way to go ladies!